If you are wondering what kettlebell weight you should be using for which exercises then this is the article for you. I frequently get asked about kettlebell weights and which size weights you should buy. Although the answer to this question is relatively straight forward it is also important to consider your goals and what exercises you will be performing. So to help clear up what kettlebell weight you should use I’ve listed down my selection of kettlebells and how I use them for the different kettlebell exercises. Being a personal trainer and kettlebell instructor I’ve got a lot of kettlebells. You certainly don’t need a wide variety of weights in order to achieve your goals. 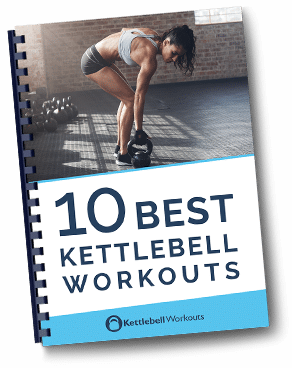 In fact 1 – 3 kettlebells is all you really need but more on this later. I don’t use my 12kg kettlebell very often, I could easily do without it but for male beginners or more advanced females it is necessary. For me I use it for warm up exercises before starting a workout, practicing new movements, and exercises that don’t necessary need a kettlebell but help with counter balance like the Pistol Squat. Bare in mind that I have been kettlebell training for over 10 years now and work with them on a daily basis so my limited use of the 12kg kettlebell is not the same for everyone. I love my 16kg kettlebell. For my goals of strength endurance and frequent workouts it a great weight for me. Many of my workouts include short flowing circuits that transition from one exercise to the next quickly so I need a weight I can keep a hold of without putting it down. The 16kg is also great for warm up exercises where I don’t want to over challenge my system. The 16kg allows me to perform lot of variety without over challenging my body so I recover quickly while at the same time stimulating hundreds of muscles at a time. I’ll interchange this 20kg kettlebell weight with the 16kg when I just want to add a little more to my flowing kettlebell circuits. Often I’ll perform a warm up circuit with the 16kg and progress to this 20kg kettlebell. I’ll also use the 20kg weight for pre-warm ups for more strength based exercises before using the 24kg kettlebell below. There are also other more challenging exercises including the: side lunge, single leg cleans and bottoms up presses that I prefer to use the 20kg kettlebell for rather than a 24kg. The 20kg kettlebell for me acts as a bridging kettlebell weight between the 16kg and 24kg. I could reduce the reps and perform the same exercises with a 24kg but I like being able to achieve a decent rep count with this weight. The 24kg kettlebell tends to be my swinging weight and the one I use for the strong basics including: squats, cleans, presses, lunges, rows etc. I don’t use the 24kg kettlebell for flowing circuits so l put the kettlebell down in between exercises. I also like to use the 24kg kettlebell as my go to weight for Turkish get ups, single leg deadlifts and snatches. Along with the 16kg kettlebell the 24kg kettlebell is the one I use the most. However, this weight does not challenge be fully for swings and get ups so for these I go a little heavier. For more strength based exercises I use the 28kg kettlebell. I’ll push my kettlebell clean and presses with this kettlebell. I also use this kettlebell for strong leg based kettlebell exercises like the deadlift and working through some more intensive Turkish get ups. The 28kg kettlebell is another bridging weight like the 20kg. The 28kg helps you move from the 24kg to the 32kg for more strength based exercises. I love it for kettlebell swings too! The 32kg kettlebell is the heaviest kettlebell that I use. I use this kettlebell for real strength building exercises and limit this to only a handful of exercises. I keep the repetitions low with the 32kg and tend to use ladder based workout formats. I’m strong through the Turkish get up so I use the 32kg frequently for working my core and shoulder stabilisers. I also enjoy performing 60 second of cleans with the 32kg along with overhead push presses. In my collection of kettlebells I also have a selection of kettlebells that are the same weight so I can use two kettlebells at the same time. Using two kettlebells at the same time really isn’t necessary to get results from your training. However, by using two kettlebells together you can overload your legs and save training time. I certainly wouldn’t recommend using two kettlebells at the same time unless you have at least 12 months of training time behind you. I tend to use the 16kg and 24kg kettlebell the most frequently. 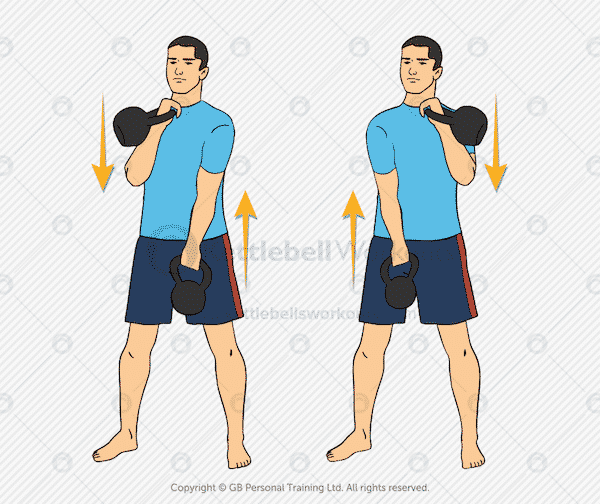 There are no kettlebell exercises, muscles or movements I couldn’t intensely work with these two kettlebells. If I had to choose just one kettlebell it would be the 16kg purely because I can make exercises more challenging without adding more weight. 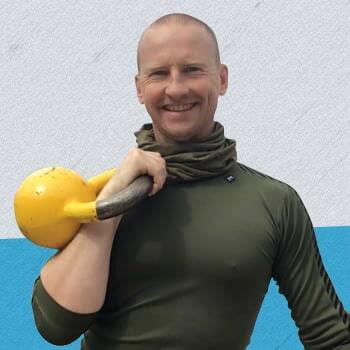 However, please bare in mind I have been teaching and using kettlebells for over 10 years, those new to kettlebell training I’d recommend they downside one level. Of course using your kettlebell with the correct kettlebell exercises for your experience is equally as important as choosing the correct kettlebell weights. I recommend all beginners start with these 5 kettlebell exercises. Kettlebell training can appear complicated and indeed matching kettlebell weights will exercise selection can be challenging. 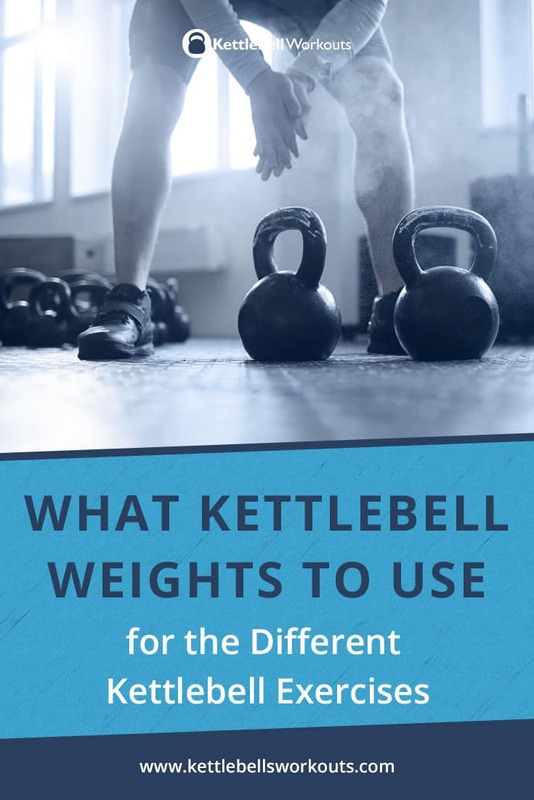 Hopefully by seeing how I match different kettlebell weights with different kettlebell exercises you can see that realistically you only need to use 1 – 3 different kettlebell weights. Your overall level of kettlebell experience along with your exercise goals will determine which kettlebell weights you should be using. I hope you have found this examination of the use of kettlebell weights useful for your own kettlebell training. What kettlebell weights do you use? Let me know more below….